As Bradley Manning, hero of the Wikileaks scandal, endures his court martial under a near-total blanket of secrecy from the powers that be, and the tech world still reels from the suicide of Aaron Swartz (who provides a posthumous afterword), it seems a perfect time to talk about Homeland, the latest young adult novel by king of the geeks Cory Doctorow and sequel to his wonderful YA debut Little Brother. In the previous volume a young tech enthusiast named Marcus (or MiK3y) was hounded by the government following a terrorist attack on San Francisco’s Bay Bridge. Aided by overreaching new laws they hounded him and his friends, to a point including waterboarding, for their part in organising an underground knowledge network on the Darknet in order to disseminate news about the horrific abuses of power being carried out int he name of security. Homeland opens a couple of years into the future. Far from fulfilling his promise as a computer whizzkid, Marcus has been forced to abandon his college studies due to lack of funding. His government blacklisting has resulted in the loss of his father’s job, making things tight for everyone. Keeping himself busy through tinkering with 3D printing he finds himself at the Burning Man festival where Masha, an old acquaintance, appears from nowhere and passes something into his possession, an encryption key, with a sinister message. If she suddenly disappears or is found dead he is to use the key to decrypt a file hosted on Pirate Bay’s servers and make it public. As a snoop for the Department Of Homeland Security she has been collecting all manner of incriminating documents from other operatives whose consciences could no longer bear the weight of the secrets they were carrying. The file is dynamite, set to expose all manner of wrongdoing from torture to government complicity in the spiraling circle of debt so many find themselves trapped in. Soon after this meeting Masha and her partner Zeb vanish from sight, soon after Marcus spots his nemesis Carrie Johnstone (responsible for his torture) patrolling the camp. Seconds later there is a massive, ‘accidental’ explosion involving one of the automotive art installations and when the dust clears Carrie is gone. What follows for Marcus is yet another series of trials, both mental and physical, stretching his integrity and his relationships to breaking point and forcing himself to fight the demons of his past. Should he release the documents? What will the consequences be? How should he do this and does he truly have the backbone to go through with it? Both aiding and abetting his quest is his appointment to the position of technical manager for a firebrand independent politician’s election campaign. Doctorow manages to push all the right buttons in Homeland, giving us some snippets of actions, hefty doses of righteous indignation, comic relief and allowing high enough doses of reality to keep everything grounded. The characters from Little Brother become more fleshed out with that of Marcus being particularly well written. It’s no mean feat to make a neurotic, obsessive geek into a likable hero but aside from a few questionable decisions he fits the bill pretty well. In fact he veers away from the hero archetype, spending plenty of time weighing the options between going down in a blaze of glory – hounded as he is by the government, mercenaries and hackers alike – and simply ducking for cover to save his own skin and protect those around him. His decisions are real and they are hard, eliciting plenty sympathy from the reader. Most rewarding for me, and the reason I picked it up, is the fact that Homeland – like Little Brother and Pirate Cinema before it – reads almost like a manual for youth insurrection. It’s steeped in technical know-how from start to finish, discussing online privacy, cryptography, surveillance and general politics – not to mention how to cold-brew the perfect cup of coffee! I have said many times that these books make me wish I had been born in the late 90’s so I could be coming of age in a world where all of this is accessible to an impressionable teen. It’s inspiring stuff and has already inspired me to start learning a couple of programming languages as well as expanding my knowledge of Linux operating systems. Not content with simply weaving these elements into the tale, Doctorow provides a handy appendix full of links and references to get you or your child started as a hacker/caffeine addict. 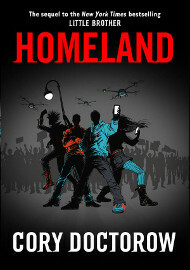 Homeland, despite its heavy topics, is a very easy and enjoyable read. If you have any interest at all in technology, the internet, freedom of speech, open government and other related topics then regardless of your age you will get something out of it. It inspires both thought and action while dressing everything up in the garb of a traditional thriller transposed to modern times. If you have kids in their teenage years simply do not hesitate – buy this book for them now. It’s dark for sure and may instill an inherent distrust for authority but is that really such a bad thing?